Released by ReSound on March 17, 2019 the ReSound LiNX Quattro 5 Rechargeable falls under ReSound`s basic technology level within the LiNX Quattro Rechargeable family. As basic technology, this hearing aid is the third best technology that ReSound has to offer, making it a solid choice for individuals with quiet lifestyles, who primarily wish to hear better around the home, in one-on-one conversations, watching TV, and in mostly quiet and small group settings. The ReSound LiNX Quattro 5 Rechargeable hearing aid has 12 channels and 4 customizable programs, and that gives it the flexibility to digitally process sound in a way that sounds natural, and can also be adapted to the particular listening environment of the wearer. The LiNX Quattro 5 Rechargeable is powered by a built in lithium-ion battery, which, when powered overnight, reliably delivers 24 hrs of power to the hearing aid. With a maximum potential gain of 75 SPL, the LiNX Quattro 5 Rechargeable is suitable for individuals with mild to severe hearing loss. With its discreet RIC (receiver in canal) style, the LiNX Quattro 5 Rechargeable sits comfortably behind the ear and is hardly noticeable to the wearer or others. This hearing aid is available in 14 color choices as shown below. If you have questions about the LiNX Quattro 5 Rechargeable that you don`t find answered on this page, or are looking for specs on this device, you might want to check out the downloadable documents (below), visit ReSound`s website, or feel free to give us a call at 800-731-6794. What is the primary benefit of upgrading to the Quattro 7? The top 3 benefits to upgrading, in our opinion, would be the addition of the impulse noise reduction feature (to soften harsh impulse noises), additional channels resulting in better clarity, and binaural directionality, resulting in improved clarity in noisy situations. I noticed the Quattro 5 is newer than the Quattro 7 & 9 models. Does this mean it's better? No. Although it is a newer model, it is built on the same chip as Quattro 7 & 9, it just has fewer features. It is common practice for a manufacturer to release high end models first, and at a later date release it in more basic models like the Quattro 5. 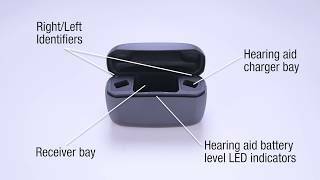 In this tutorial, you'll get to know the portable charging case and learn how to charge your ReSound LiNX Quattro hearing aids. 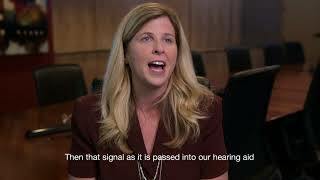 Cheif Audiology Officer Laurel Christensen, Ph.D. at ReSound gives a more in depth look at the new technology in ReSound LiNX Quattro. With its small, discreet size and long-lasting battery, the ReSound LiNX Quattro charging case gives you get power that lasts more than a full day, without having to fiddle with any batteries. The portable case’s built in battery holds enough reserve for three full charges of power—perfect for a weekend away! The ReSound Phone Clip+ lets you stream phone calls and audio straight to your hearing aids from any Bluetooth-enabled mobile phone or smartphone. So you – and the person you’re talking to – can enjoy comfortable conversations, even if one of you is located in a noisy environment. ReSound Phone Clip+ also allows your Smart Hearing aids to connect to two separate Bluetooth devices at the same time. This makes it easy to stay connected. For example, you might want to connect your Bluetooth-enabled private and work phones simultaneously. You can even use the Phone Clip+ to change the volume and program of your hearing aids. Once you’ve paired you phone with the Phone Clip+ simply clip it on and you are ready to take calls. With one push of a button you’ll hear the caller’s voice, crystal clear, in your hearing aids, even if you’re in a busy street. When the ReSound Phone Clip+ is used in conjunction with the ReSound TV Streamer 2, your phone's ringtone will override the audio streamed from the TV and allow you to decide whether to answer or reject a phone call. Phone Clip+ lets your hearing aids work like wireless stereo headphones, so you can listen to music or podcasts, as well as taking phone calls. You can choose whether to mute the background noise or let other sounds in too. Transform your hearing aids into wireless headphones. With the ReSound TV Streamer 2, you can enjoy watching TV with your family and friends again. ReSound TV Streamer 2 allows you to stream crystal-clear stereo sound from the television directly to your hearing aids from up to 22 feet away in clear line of sight. If you leave the room and go out of range, TV Streamer 2 automatically reconnects to your hearing aids when you return within five minutes. Hear what’s being said – even on the other side of the room. Don’t let your hearing loss limit your enjoyment at restaurants, college classes, community get-togethers, family functions or business events. No matter if the speaker is on the other end of the table or the other side of the room, with a range of over 80 feet, the ReSound Micro Mic can help you hear sounds you want to hear. ReSound’s Remote Control 2 gives you simple control and an overview of the volume and program settings of your hearing aids. You can adjust the volume and mute your hearing aids, or change between different programs. It's easy to see all your settings at once on the backlit display. RemoteControl 2 provides a convenient way to switch to a ReSound wireless accessories for streaming audio to your hearing aids, or balance the volume between your hearing aids and streaming accessories. The ReSound Smart 3D app offers user friendly control and customization of your hearing aids directly from your mobile device. Using the app is easy, because it helps you discover what you can do and shows you how. Use the Smart 3D app to customize and save your listening program, for personalized hearing in any environment. You can also request program adjustments and receive software updates remotely, without making a trip to the clinic. The Smart 3D app can even help you find your hearing aids if you lose them! Here are a few more of the things you can do with the ReSound Smart 3D app Stream audio from virtually any source, without lag time. Great for directions, updates and notifications from your phone, and for listening to music. Access quick hearing aid adjustments for your smartphone’s start screen. One-tap access makes it quick and easy. Use the Sound Enhancer to adjust treble/mid/bass, noise reduction, speech focus or wind noise reduction. Track the battery status of your rechargeable hearing aids and receive notifications when they are ready for use or need recharging. ReSound Control is a fully-integrated remote control app for wireless hearing aids and accessories. The ReSound Phone Clip+ is required to use this app. With the Phone Clip+, ReSound Control lets you use your mobile device to view and control your connected hearing aids and ReSound Unite accessories. The ReSound Control app allows your smartphone to adjust the volume of your hearing aids quickly without having to touch the hearing aids. It also lets you switch programs or control wireless streaming devices. For example switch to a program meant for restaurants when out dining, or start streaming from the ReSound TV Streamer 2 when you watch your favorite TV shows, all from the app. This hearing aid will come with a manufacturer's 3 year repair warranty and 3 year loss and damage warranty. As one of the few authorized ReSound retailers on the web, you can rest assured that no matter what happens to your hearing aids during this time period- you're covered with a full factory warranty. I purchased these primarily so I could hear my grandkids around the house, and to that end they have been wonderful. Performance falls apart in noise, they are no help at all, but I knew they didn't have this ability when I bought them. They have been good enough for what was most important to me.